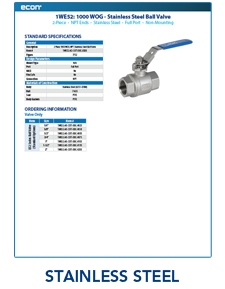 The Econ® E52 Series is a two piece, full port ball valve with NPT ends. The E52 is rated to 1000 WOG and is available in sizes ranging from ¼” to 2”. Valve bodies are made of CF8M with 316SS trim and PTFE seats. Please contact econsales@eriksna.com for more information. Econ® supplies a complete program of high-quality components - mostly combined into complete systems - to companies in the following industries: (petro)chemical, oil and gas, tank storage, shipbuilding & repair, commercial and industrial building, water, original equipment manufacturers and general industry. The core range comprises high-quality valves, fittings and instrumentation under our own Econ label and reputable leading brands. Every plant has fittings (valves etc.) Whether it is a process plant, a food plant, a marine plant, a sewage treatment plant or a plant in the petrochemical industry. Fittings are a part of any plant that works with gases, liquids or powders. These are all slightly different, but similar in nature. Our company, with offices worldwide, is part of the ERIKS group, a leading and innovative supplier to the process industry and OEM that fulfils both the role of the specialist and an extensive MRO supplier. ERIKS comprises more than 60 companies with offices in 27 countries. Before the decision is made to label a product an Econ® brand, our Valve Quality Development Team conducts a high number of checks on both the product and the manufacturer’s production process. This way, issues like casting quality and pressure testing can be evaluated, as well as the extent to which the tolerances on the different components comply with the requirements. A product may only bear the Econ label after all initial checks have been satisfactorily completed. As well as a complete range of quality products, the added value that Econ® offers can be found in various services. We want to be a partner and help develop the total concepts, always keeping the focus on the mutually determined objective.